Wally’s, the only remaining jazz club on Massachusetts Avenue. Click the picture to hear Charles Walker play. Wally’s Jazz club is packed, as usual. You brush past every person on your way into the narrow, dark club, so small it is almost hidden in the brownstones along Massachusetts Avenue. A young band – students from Berklee College of Music – has squeezed a bass, drums and guitar onto the small stage. The saxophonist alternately stands in front of the stage to play and leans against the jukebox to rest. An older man enters, carrying an instrument case, and approaches the band. He takes a seat at the front table as they begin to play. He glances at the faces in the crowd, but doesn’t recognize anyone. As the band approaches the song’s end, he takes his trumpet out of the case, puts on his sunglasses and stands up to play. He begins the notes of “Straight, No Chaser,” and takes a solo, soft and smooth, lilting. He nods to the applause and returns to his seat, taking a sip of his Heineken. He is just stopping in for a set, as he always does when he passes through town. A physician at UCLA, Richard Allen has come to Boston to give a lecture at Harvard Medical School, where he was a student 50 years ago. He remembers sitting in at Wally’s when it was a large nightclub across the street known as Wally’s Paradise. “Where jazz in Boston really has its heart and soul are places like Wally’s,” he said. Wally’s today is the only club left of its kind in the South End, a neighborhood that was a hub of Boston’s popular jazz scene from the 1930s to the 1960s. The sign outside Wally’s is the only trace of a music tradition that has all but disappeared from the neat rows of brownstones along Massachusetts Avenue. Click here for more about a few of the South End’s popular jazz spots. 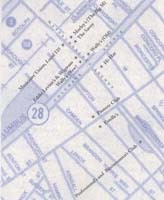 Map courtesy of the South End Historical Society. He was just out of high school, playing clarinet in the symphony when a bandleader approached his mother and asked if Walker could join his jazz band. Walker traded in the clarinet for the tenor sax and became familiar with the South End scene. He pauses, remembering all the names of the clubs he knew. Louie’s Lounge, Wally’s Paradise, Eddie Levine’s, Morley’s (known as the Big M), the Professional’s and Businessmen’s Club, the Wigwam. He saw Sammy Davis, Jr. at the Hi-Hat, once on the corner of Massachusetts Avenue and Columbus. “You had to have money to go there,” he says of the club, which had a restaurant and lounge downstairs, while the music was upstairs. The Hi-Hat was the first jazz club in the South End. It was established after World War II, when big bands had gone out and performers such as drummer Buddy Rich, Count Basie and Charlie Mingus were traveling with small combos. “The Hi-Hat sort of became a symbol of jazz in Boston. It was popular; it inspired other young guys to open clubs,” says Ray Barron, who used to book the acts for the club. He started the popular Sunday jam sessions at the Hi-Hat. He says Boston was filled with musicians from the music schools, such as the New England Conservatory and the Schillinger House of Music, which is now the Berklee College of Music. “There was an abundance of music students and they wanted a place to jam,” says Barron. Thomas O’ Connor, historian and professor at Boston College, visited a number of the clubs in the 1930s. He remembers the “small, dingy, dirty” places, like the Rainbow Club, where the dim lights and heavy smoke made it difficult to see. “It took you a moment to get your bearings,” he said. There, the small combos played, some of the best known musicians, like Charlie Barnett, Cootie Williams, and Count Basie. “They would play a gig until 1, maybe 2. When they were over, they would go to another club and play until 4 or 5 in the morning. These were jam sessions,” said O’Connor. Often the musicians would make their way down Massachusetts Avenue to The Pioneer, a popular after-hour club. Harold Layne, drummer, can still be seen doing gigs around town as he has been for 60 years. He played the South End venues, including The Pioneer. “When the musicians didn’t feel like going home, they would come there at 2 or 3 o’clock in the morning, maybe even later than that.” He compares the club to a speakeasy – you had to know someone to get in. Myra McAdoo met many of the musicians when they stayed at the Bostonian Hotel where she lived with her mother. It was one of the few lodging houses that would take in black performers. She says that after-hours was the time when musicians from different bands would play together. “You could go out and hang out all night. And I do mean all night,” she says. 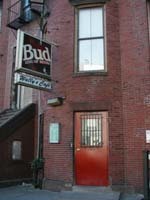 McAdoo remembers partying late at the Professional’s and Businessmen’s Club where “we had been known to get a phone call, walk around the block and come back when the police left.” Boston’s Blue Laws, which restricted alcohol use, were strict and kept a watch on clubs to make sure they closed on time. McAdoo’s mother found another way to get around the Blue Laws. Events that served alcohol were prohibited on Sundays until after 8 or 9 unless they didn’t charge. McAdoo’s mother devised a plan to pre-sell invitations to an invitation-only event. The guest showed the invitations they had purchased the week before at the door and were allowed into the event. “That way we could sell out the place,” she says with a laugh. McAdoo remembers the South End in different times when people dressed up and went from one club to the next right into the morning. “We no longer have a society where you can walk down the streets, dressed to the nines in your diamonds and pearls until 4 in the morning,” she says. Despite segregation and racial conflicts throughout the city, the South End was known as a place where people of all colors could mingle. Both black and white bands played the clubs. “Mass Ave allowed for people of all colors to come,” says McAdoo. Professor O’Connor describes Boston in the 20th century as a city of neighborhoods, divided by racial and ethnic lines. Invisible lines were drawn and people stayed within them. He does, however, mention a stratification of the clubs. He describes three phases of the jazz scene that occurred simultaneously: the small clubs with small combos, mostly black for a black audience; the big clubs, like the Hi-Hat where the musicians and the service people were mainly black, but the audience was white; and then large dance halls up the street where the musicians and audience were primarily white, swinging to the sounds of musicians such as Benny Goodman, Tommy Dorsey and Woody Herman. Barron remembers the bouncer at the Hi-Hat door, there to keep out blacks unless they looked as if they had a lot of money to spend. These rules did not apply to the musicians, though. The Hi-Hat regularly welcomed the talent of premiere black artists. The South End jazz scene flourished into the 1960s when the music scene began to change, as did the city. Jazz by its nature is spontaneous art, disappearing as soon as it is created. What is left of the Boston jazz scene remains in the stories of the people who were there. Boston - City in Transition -| Copyright © 2004. All Rights Reserved.